For over 39 years now, the A4 has been Audi best-selling model, with more than 10 million units sold worldwide. So even a minor change in this car would surely make a big news in the automobile industry. 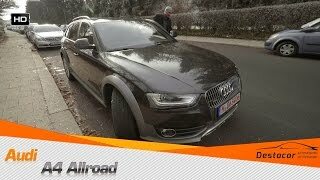 As you can clearly see from the pictures that most of the changes in the 2013 version of the A4 Allroad Quattro are concentrated at the front and back of the car. On the front, the 2013 Audi A4 Allroad Quattro receives new headlamps and a revised bumper along with Audi’s new six-point grille. The grille is a bespoke one and the bumper comes with a protection plate for some extra protection at the front. Once you move to the back, you will see that the story there is quite similar. There also the car gets new tail lamps as well as a newly designed rear bumper. But the bumper in the back of the car receives lesser changes compared to the one at the front of the car. As far as the powertrains of the 2013 Audi A4 Allroad Quattro are concerned, the US customers of Audi will be offered a range of both petrol and diesel engines. In the petrol/gasoline segment the car will have 2.0 liter turbo four engine with a peak power of 211 HP. A supercharged 3.0 liter V6 with a max output of 272 is also being thought of. In the diesel segment, the engine options include a 2.0 liter four-cylinder engine with 177 HP and a 3.0 liter six-cylinder engine with 245 HP. But in Europe the customers will have an option to choose from four gasoline and six turbodiesel engines. Transmission options include a 6-speed manual, CVT (for the front wheel drive variant) and a dual clutch automatic one. 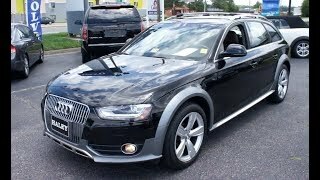 The 2013 A4 Allroad Quattro will include Audi’s excellent Quattro AWD system and will also have Audi’s Drive Select System, may be in a changed form. The Drive Select System allows the driver to choose between various performance modes. The tech specification of the A4 Quattro is given a further boost by the inclusion of the MMI Infotainment System, although a much simplified version of it. The car will hit the markets in the US this summer. Pricing and other details will only be revealed by Audi at that time.